Abingdon, VA Monday, Apr 9, 2018. This year Food City is proud to be celebrating their 100th Anniversary. The retail supermarket chain has a number of exciting events planned throughout the year-long celebration. To kick-off the festivities, Food City recently announced plans to donate $100,000 to charitable organizations throughout their market area. The funds are in addition to the many benevolent works currently sponsored by the company. 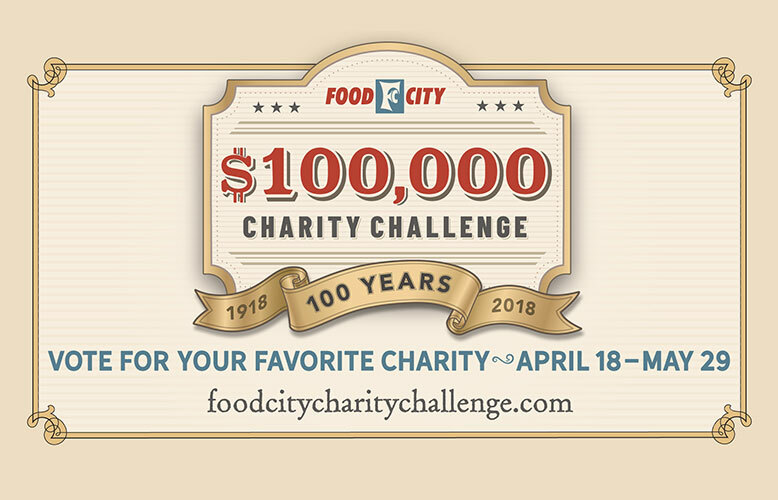 Food City has teamed up with local media partners WYMT, WCYB, WATE and WRCB to introduce their 100th Anniversary Charity Challenge. The contest begins April 18 and continues through May 29, 2018. Participating local charities have been selected from each of their four market areas - Southeast Kentucky, Tri-Cities, Knoxville and Chattanooga. Visit foodcitycharitychallenge.com/kentucky, foodcitycharitychallenge.com/knoxville, foodcity charitychallenge.com/tricities or foodcitycharitychallenge.com/chattanooga to review the list of participating charities and cast your vote for the charity of your choice. You may vote once per day per devise, however auto voting is prohibited. The charity that receives the most votes in each market area will receive $12,500. The second place winners will each receive $7,500 and third place winners will be awarded $5,000 each. Some restrictions apply. “We would like to thank our local media partners for their tremendous support in promoting our Food City 100th Anniversary Charity Challenge. We are excited to see how our customers respond during the voting process and look forward to presenting the checks to winning charities.” adds Smith.